Have you signed up to receive MailBlasts! If not, click here for a quick sign-up form that will get you registered. And you can decide which markets you want to receive blasts FROM as well. 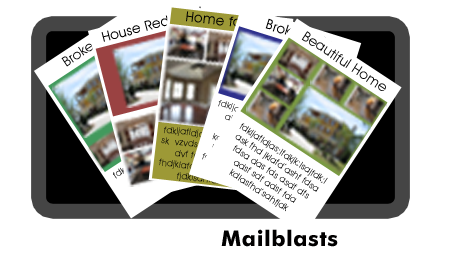 Do you have a listing, event or other real estate related service that needs some extra advertising, and want it done quickly? You can provide your pre-designed flyer in a multitude of formats (*.jpg, *.gif, *.png, *.doc, *.pdf, *.pub, *.bmp, *.tif) and we will convert it to a high-quality email-ready flyer. Or we can create your MailBlast flyer - for no additional charge - that can be sent to thousands of agents and other registered recipients in the Charleston metro area - as well as Aiken/Augusta, Asheville, Beaufort/Hilton Head/Savannah, Charlotte/Rock Hill, Columbia, Florence, Greenville/Spartanburg, Myrtle Beach & Sumter. If you would like to send to any or all of those additional markets (again, FOR NO ADDITIONAL CHARGE!! ), please indicate that in the Additional Notes field on Step 3. If you want us to make the flyer for you, we ask for up to 24 hours to design and submit a draft flyer for your approval. We will only send it out after we have approval from you. Already have a flyer designed and ready to go? Email us your flyer file or upload through our dropbox service after your purchase is completed and we will get you setup ASAP. We value our mail blast clients as much as we value those who receive the blasts. To that end, we strive to only send Mail Blasts between the hours of 8:00am-6:00pm (with the possible rare exception). Because of this self-imposed limitation, we have limited spaces available throughout the day. Should you request a time that is already taken, we will make every accommodation to get your flyer out in the next available open time slot. Be sure to order early so you can get your preferred time slot! It should also be noted that while we maintain final approval over what we will allow to be sent (based on decency and defamation), we do not support or endorse any one agent, office or service over any other. We are merely here to assist those who need our help in marketing themselves, their listings, and their services to local and regional Realtor's. Check current openings in our schedule at: CVH360 MailBlast Calendar. This calendar is live and subject to change. It is intended to show general availability, and does not guarantee your requested time will be locked. I understand that by clicking "ADD TO CART" below and completing this order that I am agreeing to the Terms of Service and that payment is due in accordance with the those terms.